If You have anything concerning tyres, wheels and windshields, we can take care of it. We have wide range of tyres and wheels from premium to budget tyres. You’ll get the best tyre brands like Continental, Gislaved, Michelin, GoodYear, Matador, Kumho etc. and alloy and steel wheel brands like Aez, Dezent, Mak, BBS, Oz-Racing, Vertini, Japan Racing, etc. Our tyre hotel is the easiest way for seasonal storage for your second set of tyres during the summer or winter. The cost is only 38 € per season, including machine washing, storage and insurance. We also check the air pressures and the condition of the tyres. When necessary, we’ll contact and inform You about it. When it’s time to change the seasonal tyres, You don’t have to worry for anything or get your hands dirty - just book time for mounting the tyres at our hotel. Mounting cost for tyre hotel customers is 32 € per vehicle. Our tyre hotel is located in Hiiskoskentie 11, but when You are leaving tyres for storage for the first time, please visit our store at Kuurnankatu 15. Has your windshield need of repair or replacement? We’ll do it using Saint-Gobain windshields, which are original spare parts. Windshield chip or crack repair costs 50 € and takes max. 30 minutes. When replacing the windshield, You can leave the car in the morning and get it back during the same day. The price depends on the features of the glass (rain or light sensors, heating, acoustics etc.). Just give us your license plate number and we’ll find out the right options and book schedule for You. Do You want your tyres to be mounted but You don’t have time to go anywhere? 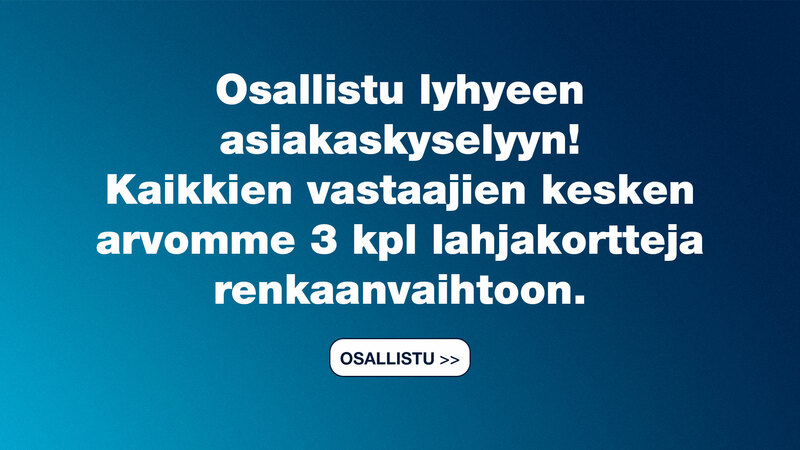 We can pick up your car from Joensuu central area, change the tyres and return the car during the same day. Price starting at 55 € per car. After the free inspection, we will give You our recommendations and make an offer. Let our experts take care of your car.